Math circles provide a setting in which mathematicians work with secondary school students who are interested in mathematics. This form of outreach, which has existed for decades in Russia, Bulgaria, and other countries, is now rapidly spreading across the United States as well. 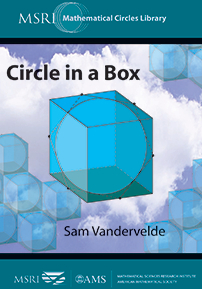 The first part of this book offers helpful advice on all aspects of math circle operations, culled from conversations with over a dozen directors of successful math circles. Topics include creative means for getting the word out to students, sound principles for selecting effective speakers, guidelines for securing financial support, and tips for designing an exciting math circle session. The purpose of this discussion is to enable math circle coordinators to establish a thriving group in which students can experience the delight of mathematical investigation. The second part of the book outlines ten independent math circle sessions, covering a variety of topics and difficulty levels. Each chapter contains detailed presentation notes along with a useful collection of problems and solutions. This book will be an indispensable resource for any individual involved with a math circle or anyone who would like to see one begin in his or her community. Sam Vandervelde teaches at St. Lawrence University. He launched the Stanford Math Circle and also writes and coordinates the Mandelbrot Competition, a math contest for high schools. In the interest of fostering a greater awareness and appreciation of mathematics and its connections to other disciplines and everyday life, MSRI and the AMS are publishing books in the Mathematical Circles Library series as a service to young people, their parents and teachers, and the mathematics profession. Titles in this series are co-published with the Mathematical Sciences Research Institute (MSRI). Secondary school teachers and administrators, college professors, research mathematicians, and parents interested in organizing math circles for middle school or high school students. [This book] is an excellent resource for those interested in math circles, including students and parents (they can just skip the organizational part and go directly to the presentations and problems). For those interested in starting and running a math circle, I think it is an invaluable resource.